You can now buy online through the website! Approximately 2000 of our best selling products are now available to purchase online. We stock close to 7000 products across our branches, so if you can't find what you're looking for on our website, please contact us as we may have it in stock or be able to order it in just for you. 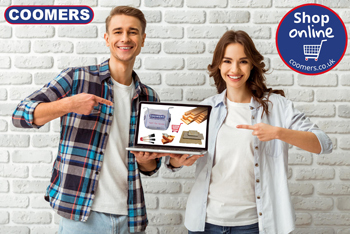 To buy online please browse through our product pages to find the product that you're after, click through to the detail view and add to your basket. Free of charge for orders over £100, or £10 for orders under £100. We are usually able to deliver your goods within 2 working days but lead times can vary during peak times. After you have placed your online order we'll be in touch to confirm a delivery date. Please note that orders are only processed during office hours Monday-Friday. We only deliver in our local area so please take a look at the postcodes we service before you start. For enquiries about deliveries just outside our area or for larger direct to site orders please contact our branches or use our contact form. We want to make your buying experience as easy as possible, so at any stage if you have feedback for us that would improve the website, we'd love to hear it. Please feel free to send us a message through our contact form. Click here to find out what many of our online shopping customers have to say about their experience!